There’s a lot of talk right now about how self-employed people and Entrepreneurs are the future. With so many without jobs all over the world, a number of people – perhaps larger than in my lifetime – are faced with no choice but to roll up their sleeves and employ themselves. What does it take? What are the pitfalls? What do you fear? I’d love to know. I’ve been self-employed now since July 1977 and I’ve forgotten what it’s like to be right at the beginning of this journey. I can share that it is often worrying but that there are infinite compensations for that including no boss and no commuting. The “job” of the self-employed person is to get up every day and make their own opportunities. Initially nothing comes to you, you have to go after everything. After a while (usually about three years) that changes. You have created a marketing noise around you and what you do, you have some word of mouth referrals creating a buzz and now and again the phone just rings. People want you and your product or service without you having to lift a finger. But of course you have lifted a finger, throughout those previous three years you have worked very hard indeed to achieve this moment, you’ve worked those fingers to the bone often. Some of the uncertainties never go away. But you learn to thrive on that. If you are a control freak, that’s OK because you have total control, you have “the con” as they call it in one of those Up Periscope submarine movies. You are in total control. Yikes. That’s good and that’s bad. It means you take all the praise and all the brickbats too. The buck stops with you. But when you master your fears and your marketing and your systems, there is perhaps no finer success than that enjoyed by the successfully self-employed based on all your own work. It was my idea and my creation and it served the world. It continues to serve the world and it may not even depend upon me to do that. Imagine that – your self-employment became a business which you could sell? These are exciting times when many people will get the chance to re-invent themselves. Is that you? 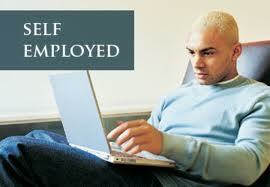 Are you contemplating a life of self-employment? Do use the comment box below to share some of your concerns and questions – or Ask Judith – and let me help you get going.